Baltimoreans To Businesswoman: Not So Fast, Hon A Baltimore businesswoman has trademarked the word "hon" for her own commercial use, but some in the city are protesting, claiming the expression belongs to no one and everyone. 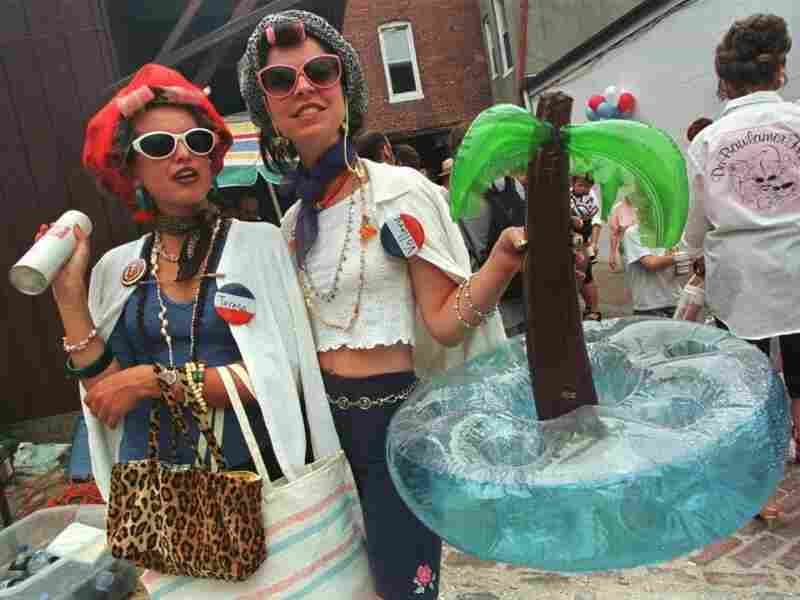 Baltimore residents Patricia Granata and Christine O'Connell wait for Baltimore's 1999 Best Hon Contest to begin. Part of the city's annual HonFest, the contest takes a humorous look at Baltimore natives and their customs. The word "hon" has been part of Baltimore, Md. 's lexicon for decades, and it's an inherent part of the city's working-class roots. But now locals have learned their favorite term of endearment has been trademarked for commercial use by a local businesswoman, and some are protesting the co-opting of what they say is a "Baltimore thing." To certain people in Baltimore, the word hon, which is short for honey, isn't just a nice thing to call someone. It's a person -- that beehived, cat's-eye-glasses-wearing, working-class woman of the late 1950s and early '60s. 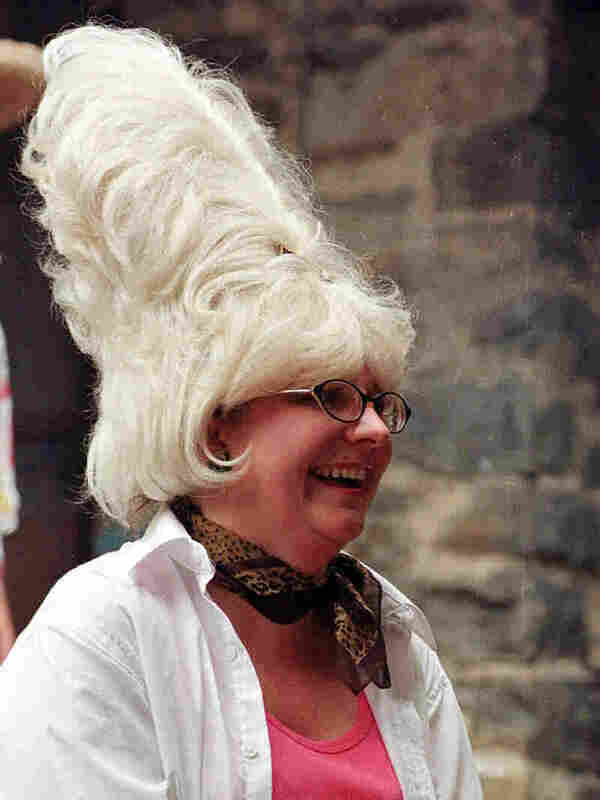 If you've ever seen John Waters' 1988 film Hairspray, you know what she looks like. But Mary Rizzo, historian on all things hon, says the word is also a place in time. "It's very much located in [the] ... immediate post-World War II period when the memory of Baltimore is about these tight-knit neighborhoods," Rizzo says. Those neighborhoods were places like Hampden, a gritty group of rowhouses just north of downtown. The neighborhood was originally home to white millworkers, and Rizzo says they more than any other group used the word. "People who were outsiders were not welcome, and often those were people of color," Rizzo says. Today, Baltimore is majority African-American, but the neighborhood Hampden still remains predominantly white and is becoming increasingly gentrified. Along Hampden's main drag, called The Avenue, is Cafe Hon. And behind the counter, in a hot pink chef's coat and rhinestone glasses, is Denise Whiting. She is the owner of Cafe Hon and also the owner of Hon Bar next door and the gift shop Hon Town. Whiting is also the founder of HonFest, an annual daylong festival celebrating Baltimore customs. Whiting has trademarked the word hon, but she says she doesn't own the word. "It absolutely belongs to everyone in Baltimore," says Whiting. "I cannot take away the noncommercial use of the word ... the trademark has to do with commerce," she says. Whiting says she got the trademark a year ago after another business was manufacturing similarly designed products and selling them at the airport. Most people didn't know about the trademark until a local newspaper recently reported it. Whiting's lawyer, Kathryn Goldman, says the business owner has spent 15 years building her trademark. "This is her identity," says Goldman. "Her brand." But those opposed don't agree. The halls of social media have been crammed with outrage that Whiting now owns something most people here say belongs to all of them. They say the hon tradition didn't begin with Whiting and hasn't always been associated with her stores. Historian Rizzo says the reactions to the trademark have been "stupendous." "These folks have felt that their use of the word hon was part of who they are," says Rizzo. "And for [Whiting] to be seen as using it to make money is to take away the meaning they associate with it," she says. Dozens have picketed. Editorials in local papers have raged. And groups on Facebook call for a boycott of her business. But on a recent night in Hampden, The Avenue aglow with Christmas lights and families out for dinner, three lonely protesters outside the restaurant were ignored. Inside, Cafe Hon was packed. Still, college student Rachel Avallone agrees the word is a Baltimore thing, not a Cafe Hon thing. "My friend's grandmother uses it for every other word, like, 'How are you, hon?' Just like that it's after everything, if she went to the store, 'I went to the store, hon.' "
The word hon is not a name or a place, but a feeling, says Avallone, belonging to no one and to everyone.